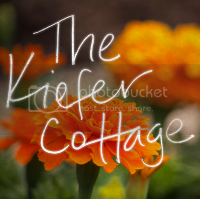 The Kiefer Cottage: Hot tomatoes. In the garden, of course. Here it is now. We have a huge garden this year because we decided we'd seed grass in the fall rather than this spring. Next year's plot might be considerably smaller. We shall see. I've grown tomatoes many times in my life, but I've never had the vines go this crazy. I haven't been very diligent about taming them, though, and this garden gets more sunshine than any I've ever planted. The empty spots on the trellis are due to weak seedlings. Some heirloom varieties just aren't as hardy, and they didn't survive despite hardening off and plenty of coddling. Boohoo. On a happy note, I planted beans and some of them are the pole variety, growing among the tomatoes. They're probably garden enemies, but I don't care. Chard is very cute in the garden. Our orphaned pumpkin seedlings...one has really thrived. The squash is getting ready to go overboard. (If you want your ego to swell, grow summer squash. You'll look like a gardening genius.) I have five squash plants--1 zucchini, 1 yellow, and 3 scalloped varieties--you can't see them in the photos of the big garden, but they're behind all the tomatoes. Yes, I'll be leaving some on your doorstep. A few little ones. I've got a couple of big ones, too. My corn and sunflowers. I thought since I live in Kansas, I should grow both. I planted more, but animals ate the seeds, even with me sprinkling hot pepper all over the ground. I did search city code to make sure growing vegetables in the side yard was kosher, but thankfully found nothing on the matter. Some HOAs relegate crops to the backyard. What a shame. I think the corn is lovely. How's your garden growing? I'm enjoying everything about mine except the water bill. We need some rain on the plains, please! Cut raw zucchini in sticks and give it to the kids with something to dip it in - they will love it all crispy, crunchy (can soak the sticks in water in the frig for an hour or two to really crisp them up. Works with raw yellow squash "rounds" also.